Gladly I don’t have much new to report! I’m still riding Khaleesi in the halter and loving it. I’m starting to wonder if I’ll grab my bit again and under what circumstances that would be. What I’ve found from riding in the halter is that (first) I’m better all around because without the fallback of perceived ‘head control’ I somehow sense I need to be. I’m letting go of a tool most people believe is pretty basic to riding. 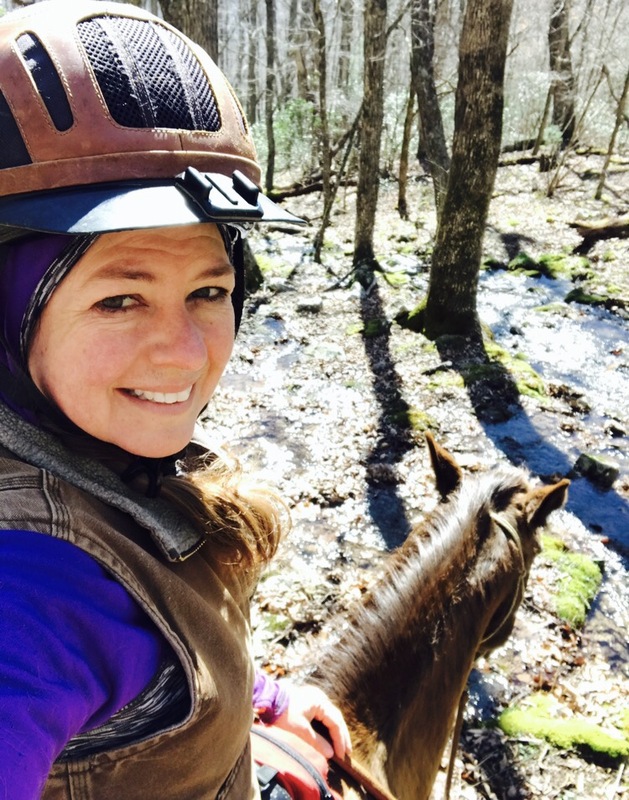 Shout out to some endurance riders I respect and am inspired by for good horsemanship as well as great riding: Elise, Dale & Kelly at the top of riders who are riding in a halter and made an impression on me. I find myself a little more focused. I think about clean and clear communication for everything in advance. I use my legs to communicate a million times more and think more carefully about how I’m using them… when, where, and how much (pressure). The second thing I’ve realized is my comfort bit really doesn’t give me *that* much more control than riding in a halter. Not like I thought it did. In general Khaleesi and I work well together and are on the same page. Granted, I started her from a feral animal I couldn’t get my hands on or even halter as a 4 yr old. 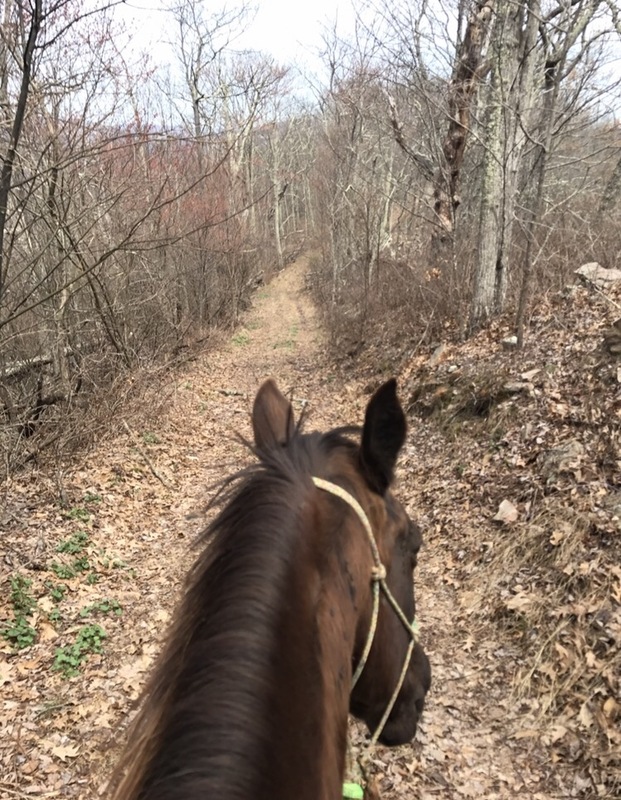 I slowly gained her trust, got her under saddle and then on the endurance horse trail. It may have been messy at times but we did this together… not quite 3 years later we have built a partnership and that fundamental base is a major factor. Mutual trust is huge and worth building. Most of the time we are on the same page so riding in a bit or a halter wouldn’t make a difference anyway. Of the few times I needed to insist on something that was not on her agenda I found I was able to do it without much more struggle than if she’d been in a bit. One instance she was terrified of a working crew at a house near the river crossing. I’m not sure what they were doing but it involves large trucks, tractors and very loud unpredictable noises. I had to get off her momentarily to open the gate we normally have no trouble doing from the saddle and I had to firmly insist it was fine and let’s go forward. I wondered if a random bam or crash would have us rodeo spinning but we got through it fine. The other was during a longer ride where I kept adding detours to bring up our mileage. At one point she dug in her heels so to speak and refused to take the ‘long’ way when she *knew* I was confused or crazy: that is not the most direct route home! What is with you today!? I was able to redirect her onto my detour but I had to make a couple circles as she tried to turn me back the way she knew was better. Yep.. it’s really this way… yep… it’s another climb! Still not much worse than if I’d had the bit. And the few times she wanted to canter close to home and pick up more speed than I was comfortable with she came right down under control just fine with the halter. Why? Why would I ride in just a halter? Is it better? I have a feeling the trainer/clinician that’s coming next week will ask me this when I talk to her about riding bit-bridle vs. halter only. So I’ve tried to think about it in advance. 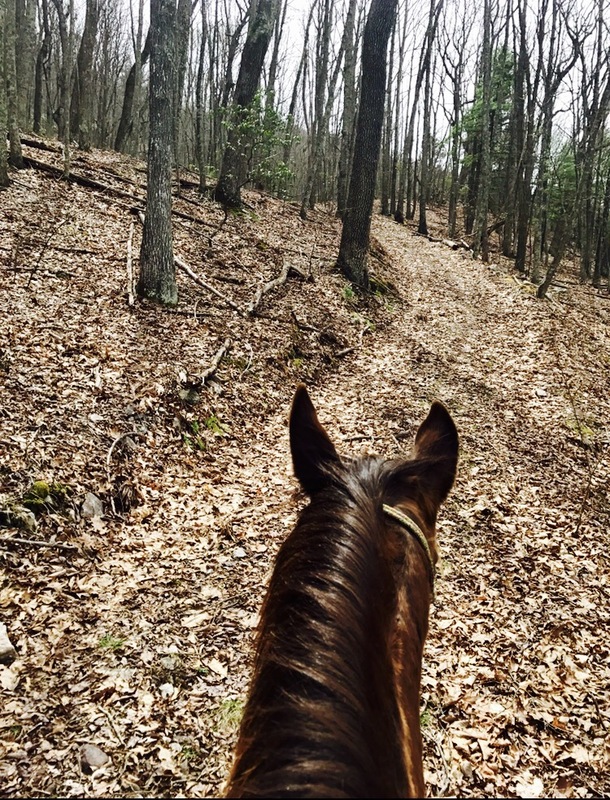 1- For 50+ miles on the trail it seems like not carrying a metal mouthpiece would be preferable by the horse right? (Trying to view from the equine perspective). I love the less is more approach of it. 2- She seems to like it… from what I can tell. 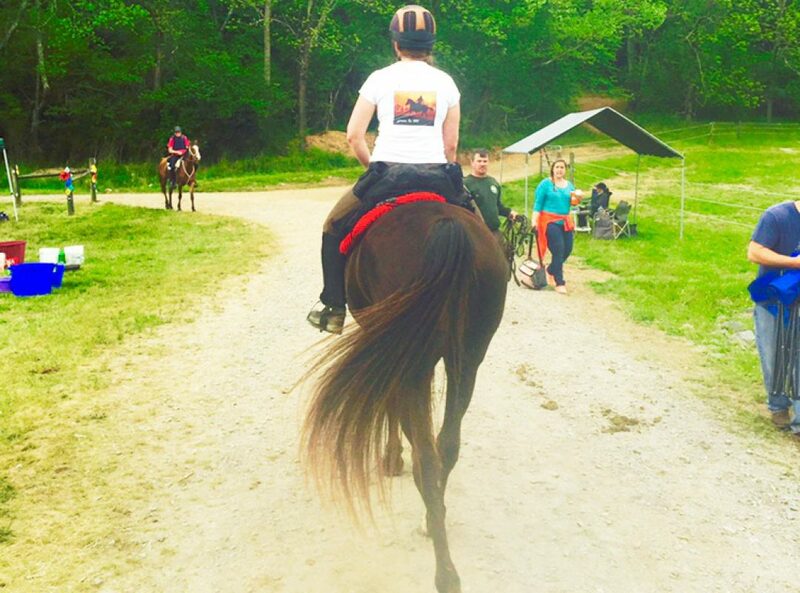 Would I ride the next ‘race’ in a halter? I plan to start the No Frills after the first round of riders are gone because with past lameness and hoof sensitivity I don’t want her going faster through rough footing right now due to race brain. I think she’ll do ok in the halter if she’s not in the first wave. If I find the start of the ride is too much right now I’m certain after the initial adrenaline is over I’ll have no issues. So…. I’ll let you know if I go that route and how it works out. Speaking of mutual trust, we had a dicey moment in our last ride that made me infinitely grateful for that bond. Going around a large downed tree I chose to go down into the mostly open woods and when Khaleesi stepped over the bank (somewhat steep and about 4 feet of incline) her back leg sunk down into the soft ground and caught a large grapevine just buried under the leaf litter. 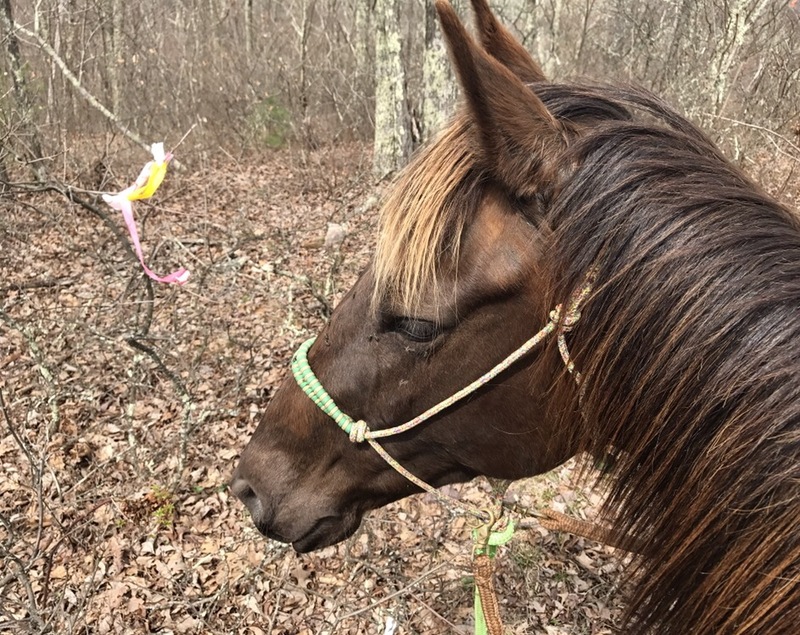 We run into parts of old fencing and lots of grapevine in our woods so I am always aware if she stops short to see if we are caught and sure enough we were, but on a hillside and she had to work hard to back up just a small amount to take some pressure off the hung leg. I calmly asked her to stand quietly for me to get off and she did though she was concerned- her back leg completely hung in the thick vine. I got off quickly as I could and started by seeing if I could pull the vine enough to get it off her leg- she’d have to back up a little more. Still it seemed a better choice than trying to cut through the thick vine with my pocket knife which I’d also have to dig out of my vest tied to the saddle. She may not wait that long before beginning to try to thrash herself free. I got her to back up just enough and pulled the vine as forward as I could and got it off her leg. When I convinced her it was safe she took a couple steps to check and we were able to continue on without incident. 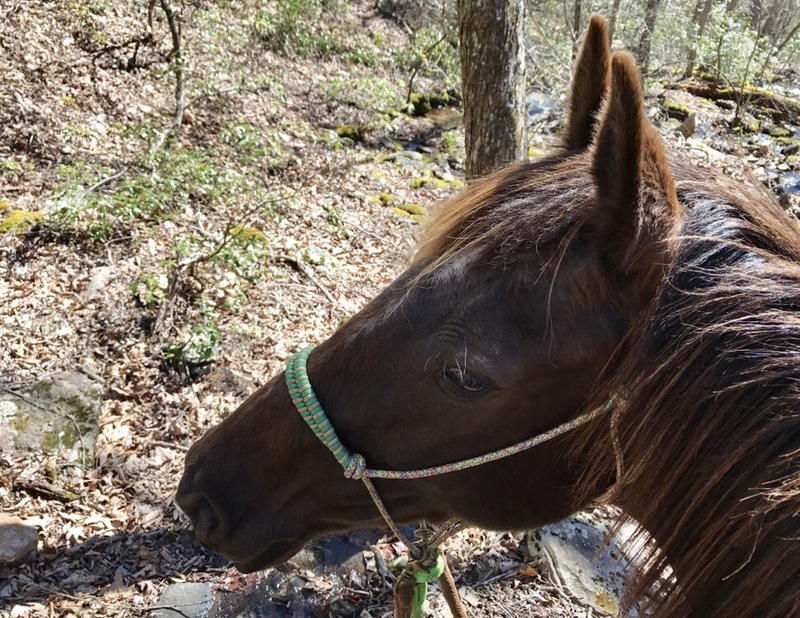 I marveled at how she trusted me to get her leg free and worked with me while her rear leg was being held by a thick vine on a soft hill that was hard not to slip down. I am always thankful when crisis is averted as I know any riding can be dangerous and they are called ‘accidents’ for a reason. Having built that trust between my horse and myself is a huge safety ‘net’ that has kept me out of trouble more than a few times. She’s truly a great mare. It’s hard to capture incline with a photo. This is a section of the many miles of hill climbingweve done over the past weeks. That’s the halter part. The hill part has to do with a tweak in my current conditioning program. Due to some concussion damage in her coffin bone that I’d like to have a chance to heal, under the advice of my amazing mentor… I’ve taken a different approach to our conditioning window before No Frills. In the past I’ve worked on adding more trot intervals as she’s not yet a ‘fast’ horse and the more we add trot and canter intervals she develops more efficient speeds at them both. This time I’m avoiding trotting except on nice footing and we are climbing the mountains here. Thankfully every direction from the barn includes a mountain to climb. 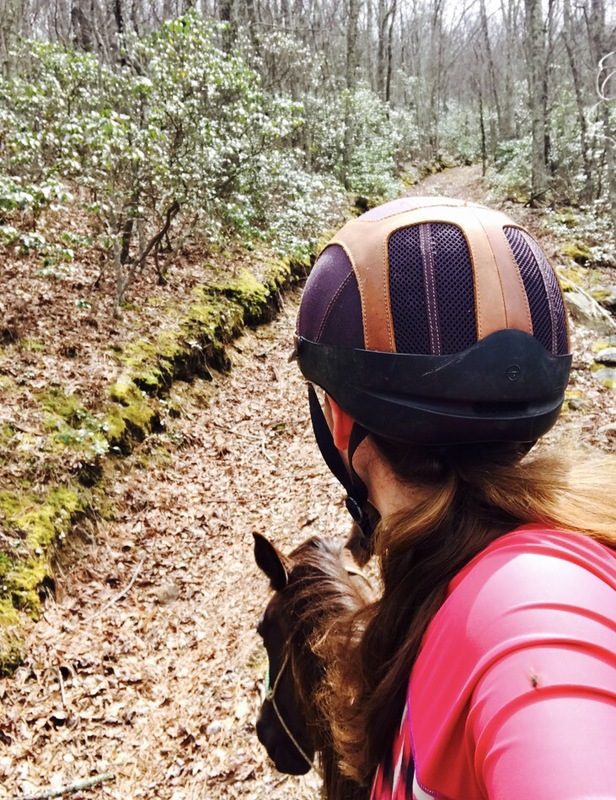 In times past I’ve gladly left the barn to find some pretty river valley or ridge riding to trot and canter along and minimized the intense climbing… climbing just isn’t that fun for either of us and often Faygo was my conditioning buddy and it’s hard on her. 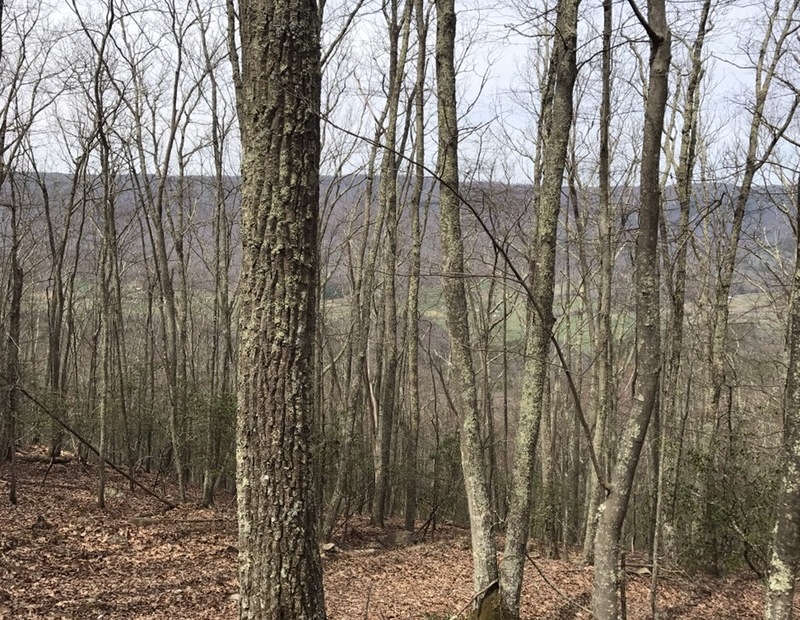 Up on the ridge trail. I love ridge trails! This time we made it our main conditioning plan. Sunday was the last conditioning ride before tapering down. 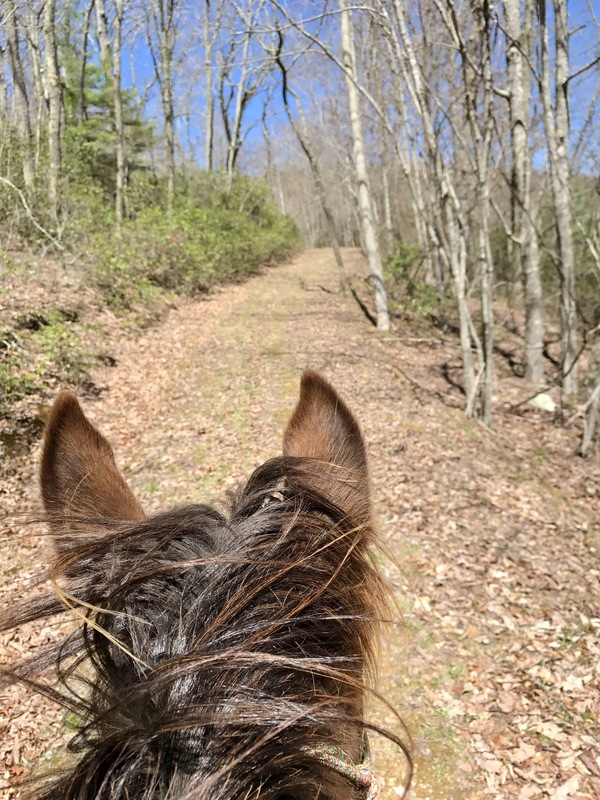 I added all those annoying climbing detours she protested then once finally turning toward home ‘for real’ I set us on lovely grassy paths and let her trot and canter as much as she wanted. After almost 10 miles of up and down the mountainside she still had plenty of gas to run home at a nice clip. I’m pleased to report no lameness issues have cropped up since our vet visit last month. She came through the Blackwater 50 in better shape than I did and has stayed sound since then as well. One curiosity has been her left front shoe has begun to twist and is worn unevenly. I sent pictures to my vet and farrier and though it’s slightly unusual it’s not unheard of. The wear especially is somewhat common but the twisting of the placement of the shoe is odd to me. Because we weren’t going to be doing a lot of fast hard training and K doesn’t tend to grow a lot of hoof we opted not to change the shoe till closer to the event. It doesn’t make sense to keep adding nail holes more than we need to. I think it’s connected to the fact that we are both not comfortable on the left diagonal. I say we because I know it’s not just me. Though it likely began with imbalance of mine I have been working on that over more than a year and have definitely improved- but she doesn’t seem to be as comfortable when I’m on that side. I’ll be talking to the clinician about that for sure! Otherwise a few trail cleaning and easy ‘leg stretching’ rides with my mom- who I’m very excited to say is visiting this week!! I believe K is as ready as she can be for the No Frills 55. It will me my first time through that distance course- in years past I’ve done the 30. It’s a tough ride but still one of my favorites! This will definitely test her soundness as true to the OD style it’s full of rocky rough riding and we’ll have to ride smart. My hope is to finish and keep our completion record intact for now even if we win the turtle (last place). Next: Next post: Refined through the fire. Good for you for trying and sticking with the bit less method. I am slowly trying to get all of my horses into the bit less life style for my horseback riding vacation business. Although some clients worry about not having this aid, they usually see how relaxed the horse can be with out the constant nagging of a bit. It’s not a method for all people or horses, but I think it a great one to try. Keep up the great work.